You hear about it a lot in nursing school, and sometimes you even encounter it in a clinical. Death is a reality of life, something everyone has to deal with—nurses more than most. 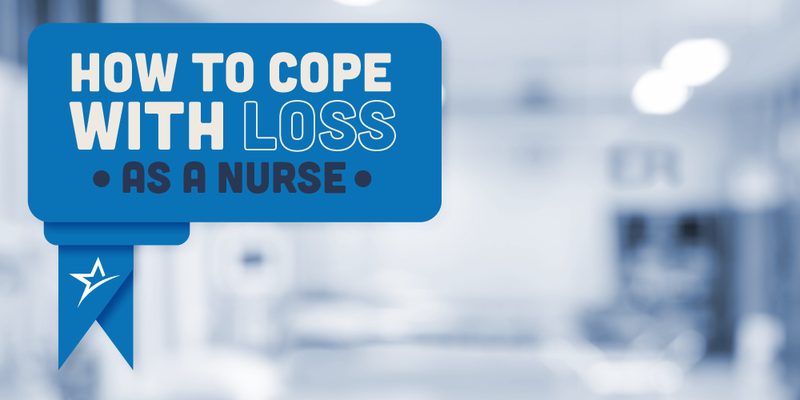 In just about every nursing specialty, you’re going to come across death, and part of learning to become a nurse is learning how to cope with loss. Whether you knew them for 15 minutes or 10 years, when patients die, it will be hard, sometimes painful, but it’s part of the job of being a nurse. As you gain years of experience, you’ll become better at managing your emotions and grief, but wherever you are in your nursing career, keep these pieces of advice in mind. 1. Remember it’s your job. Patient empathy can be a powerful tool for making you a successful nurse, but it can also make loss more painful. When patients die, you’ll feel grief, usually more the longer you knew them, or if they reminded you of a cousin or friend or parent. With empathy the death becomes more personal, but you have to remind yourself that it’s your work, not your life. As much as you may have cared for a patient who dies, remember it’s your career to care for people, and the grief you feel means you did your job. 2. Remember it’s okay to feel. Some healthcare workers try to rationalize away any sadness about patients’ deaths, suppressing the feelings they have in the aftermath. Nursing specialists agree this isn’t just an unrealistic ambition: It can be psychologically dangerous to try to hold everything in. You have to remain professional and composed after a patient dies, and if it occurs during your shift, you have to continue to serve your other patients effectively. But you can feel sad or confused or disappointed or angry. Death is a difficult thing, perhaps the most difficult part of life, and whatever you feel is okay, as long as it doesn’t prove debilitating to your work. 3. Remember it’s good to talk. One of the greatest assets any nurse has is other nurses. Because death and loss are so prevalent in the healthcare field, you’re often surrounded by coworkers and colleagues who have experienced these challenges many, many times. Whatever you’re feeling, they’ve probably felt it too, and processing your emotions out loud with another empathic nurse can help. Colleagues can relate similar stories or offer advice for coping mechanisms and rituals they found effective, and they can help you figure out how to talk to the family members who have just lost their grandparent or child. You’re likely to begin scrutinizing every moment you spent with a patient after he or she dies. You’ll wonder what you could have done differently, and you’re likely to feel guilty for something like an instance when you were impatient or distracted. Remember you can’t be perfect, and that death happens to even the most attentive and compassionate nurses. There may be things you can learn to be a better nurse, but blaming yourself is never a helpful coping mechanism. 5. Remember you’re making a difference. A death is not a failure, and it doesn’t always signal the end of the patient’s care. Part of being a nurse is not just serving patients but their families too, and some of the most meaningful moments in a nurse’s career are when she cares for suffering family members. Whatever you feel after a patient’s death, his or her loved ones will feel much more, and nurses are often the first people they encounter after the loss. How you treat and talk to them is an extension of the care you were providing to your patient, their father or sister or baby. You can make a tremendous difference in their lives, which will help them cope with loss—and it will help you too. At AmeriTech we want to prepare our nursing students for everything they’re likely to encounter in their careers, especially the challenging and painful aspects of being a nurse. Our nursing program teaches future nurses about how to cope with loss and serve patients and their families well. To learn more about the curriculum, read here, and please reach out with any questions. We’d love to hear from you.